Last Friday, I went with some folks from the office at one of Cebu’s famous dessert hangouts. We headed to The Walk before midnight and went straight to La Marea, in Asiatown IT Park, Cebu City. Since I’m a sucker for cakes and pastries, I had a hard time choosing among all those yummy-looking desserts. 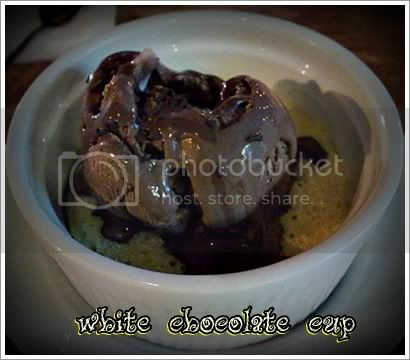 My two companions ordered the warm brownie cup while I ordered the white chocolate cup. What influenced my decision? 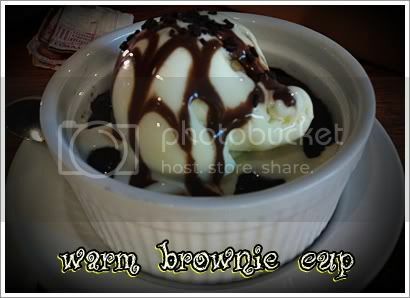 The price, being P95 (less than 100) and the rest of them ordered the warm brownie, so I chose the other one instead. ehem…g-ubo ko now dah…nag laway ko sa imong ice cream!!!! .-= sweetdonut´s last blog ..you have to watch this! wonderbaby! =-.